A music lover and a record collector and also a vinyl-only DJ who started collecting records in 1978. Where are you based and why there? I live in the south of the Netherlands (Limburg). I was born there and still live there. When did you fall in love with Disco and what was the catalyst? It was in 1978. My brother was studying in Nijmegen, a place that is a 100 miles from my hometown. There were discos where they played Sister Sledge, Aleem and similar kinds of records. After visiting those discos and hearing those sounds, I was infected by that music, and it never stopped. I also collected Funk and Jazz-Rock at that time – which I still collect. At the same period, there was a bar with a dance floor and a DJ in my hometown. They were mostly playing funk there. Later, a discotheque called Galaxy opened, with laser shows and a dance floor that lit-up. They played more disco music there – I remember hearing Harry Thumann’s Underwater in 1979, which sounded and looked great with the laser show and smoke. I can imagine your record collection is huge, how many pieces strong is it? I never really count. I have a full wall with records in my living room, and a smaller one in another room. For me, it is not about how much you have, but what you have in it. Are you just a collector of Disco records or are there any other genres in the collection? No, I am not a Disco-only collector. My collection contains, Funk, Rap (old school-electro-disco rap), Jazz Rock and Disco. I mainly collect records from the years 1975-1986. You’re a legendary collector of Disco related acetates, can you explain the attraction and how did you discover disco acetates? In the early days, I was also a disco medley collector (described in my first book). When E-bay first started, I won a medley on acetate, and when I received that I was wondering what it was because it wasn’t vinyl and it a was one sided metal plate. Later that year, I bought more and found out about the 10-inch re-edits and was curious about their history. After collecting and putting them on my page for a few years, I came into contact with John Morales and Rick Gianatos, so I learned some more on the history of acetates. Honestly, I wish I had known about them earlier, so that I could have had found even more! The attraction for me, is that most of the acetates where never issued commercially and were mostly custom made. Also, I discovered that there are acetates/test pressings from major companies that contain unreleased tracks, or tracks that were deleted for the commercial issue. All of which makes it fun to collect them. Do you actually know which acetates and records you are looking for, or is it just a case of seeing what turns up? No, with acetates you never really know what you will get. However, when it is mixed by a famous DJ – who records/mixes I already own – I know it will be good, most of the time. During the last 20 years, I have bought several DJ collections with acetates, so I know by experience what could be interesting or not. 80-90% of the company’s 12-inch acetates are the same as the vinyl copy, so there are only a few, which are good to collect. As for vinyl records in gerneral, there are still a lot I am looking for. I’m always surprised by the tracks that show up and are completely unknown. What is your favourite acetate that you own? Several, I love the Disco Queen acetates I have, and my goal is it to get all of the ones that were made. There was a matrix number list and I still want to fill in the gaps I have. My favourite acetate is the Walter Gibbons mix of ‘It‘s a Better Than Good Time’ by Gladys Night and The Pips. For many years it was an unknown mix to many people. Is there one that you are still desperately trying to find? All the missing Disco Queen Acetates! Also, the instrumental acetate of ‘Work That Body’ by, Taana Gardner. Do you find – like many – the ‘search’ for records is a neverending cycle? 100 % yes! It is always great to find records you did not know before. I’m always surprised by new records that show up that are from the 70s and 80s. You’ve written a book and displayed your wares at exhibitions/music fairs right? Give us some insight into what went on when compiling the book and what’s involved when you do the exhibitions/fairs. In collaboration with Patrick Vogt I have created 2 books. The first book was an idea from Patrick Vogt. At that time, there was a book that Freddy Fresh had documented on Rap/Hip-Hop records categorized by label. I already had a website on which I documented the bootleg medleys and Disco acetates, so Patrick asked me, “Why not create a book about this subject?” as there wasn’t a book like this out there. There was no publisher who wanted to publish the book, so I decided to publish it myself. That was in 2007. As for the second book, Patrick Vogt came with the idea to make a book with disco covers in real size. Looking for a good format, I came up with the idea to categorize the disco labels with all the pictures of the covers and make it an encyclopaedia. I made a proposition and went to Soul Jazz Records in London, and after several meetings, they decided to publish the book. It resulted in a unique, one of a kind reference book, beautifully designed. It took a lot of work designing it, two years and 2 full days in a photo studio, photographing 2000 record covers. It’s nice to see that the Disco Book shows up all over the world and is called an essential book on several forums! 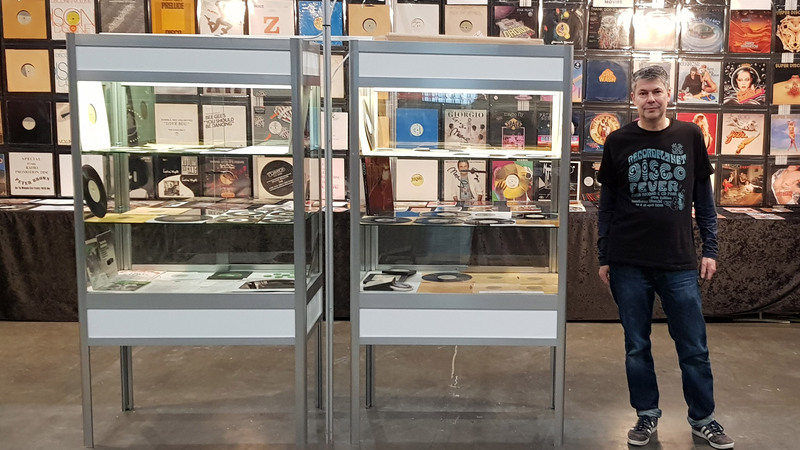 This year I was asked to do a Disco Exposition at the Utrecht record fair (One of the biggest record fairs in the World). It was titled 45 years of Disco Fever 1973 – 2018. The exposition was built up with the help of a timeline that leads the visitors through the origins of Disco in 1973, the start of the DJ-culture and the creation of the remix, the birth of the 12-inch and the debut of the synthesizer. • Acetate re-edits from the personal collection of Walter Gibbons, among which the original acetate of ‘It‘s a Better Than Good Time’ by Gladys Night and The Pips. • The original acetate remix collection of François Kevorkian and John Morales. • Acetates of, among others, Larry Levan, Patrick Cowley, Rick Gianatos, Robbie Leslie and other DJ‘s. • Record Pool promos and unique promos by record labels. • Original vintage disco books, such as Disco by Albert Goldman, magazines and flyers. It was fun to do and there were a lot of visitors who were surprised to see the history of the acetate edit. What’s next for Disco Patrick? I am taking a break now. The only planned thing for now is to issue my online magazine Hot Stuff, which will be issued in October. Also, I will be doing some DJ sets. Finally…give us a Disco top ten! No rare ones, but good tracks which i mostly have in my bag when i DJ. All of them were bought in 1978-1979 and i still enjoy them.